I wanted to take another look at how Nokia and RIMM are doing. 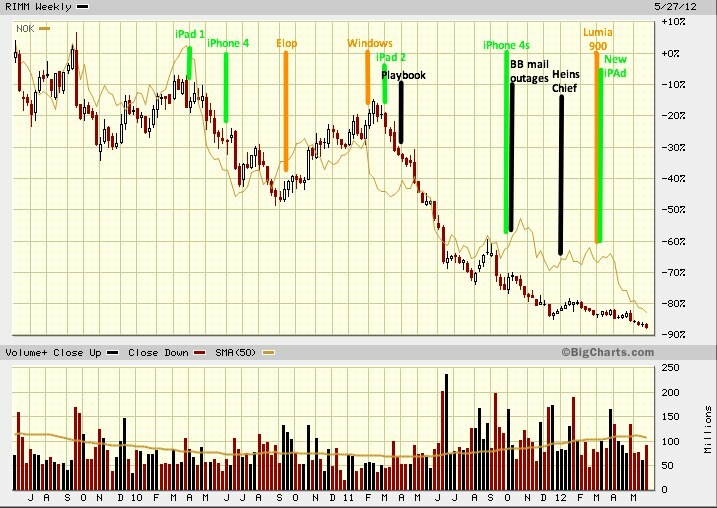 The graph below shows their stock prices compared over the last 3 years - the candlesticks are RIMM, the brown line Nokia. 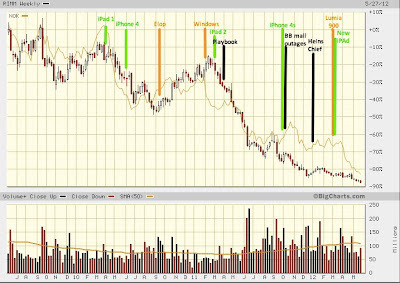 I've annotated the chart with just a few key events - Nokia in orange, RIMM in black (of course), Apple in green. In June 2012, Nokia is worth $9.8bn and RIMM is valued at $5bn. I wrote up my "prescription" for Nokia in March last year, not long Stephen Elop had made the decision to go with Windows. I didn't write a similar prescription for RIMM. From here, I see Nokia surviving - without Nokia, Microsoft's mobile strategy is dead in the water. Maybe Microsoft will buy them or, more likely, maybe they will keep pumping money into them to help them deliver. The Lumia is a good first effort (though they should have thrown them away and started again as I suggested), but it it's far from enough when compared with the latest Galaxy from Samsung or the iPhone 4S let alone what's coming next. They still need to do more - get rid of NSN, embed new features in their phones, make some smart acquisitions, cut more people (sadly) and so on - but it's achievable. But RIMM is, I think, done. They have no one to save them. They are still to get their product transition going to the new o/s (and Nokia is down over half since even starting that process). Microsoft, Nokia and all of the other rumoured buyers won't step in for RIMM - they don't want blackberries. Perhaps a PE company will step in and run the company for cash, but that would be a lot like buying Nokia's Symbian business - it's declining fast, faster than most (including me) expected. To turn them around from here, even with the relatively large cash pile that they have, just doesn't seem likely.